A key development was the foundation of the Inland Waterways Association, and the establishment of fledgling weekly boat-hire companies, following the example of such companies on the Norfolk Broads, which had long been used for leisure boating. The authority responsible for the canals, the British Waterways, encouraged this process from the late 1950’s by operating a fleet of holiday hire boats, initially converted from cut-down working boats. The local authorities began to see how a cleaned-up and well-used waterway was bringing visitors to other towns and waterside pubs — not just boaters, but people who just like being near water and watching boats (They began to clean up their own watersides, and to campaign for “their” canal to be restored. As a result of this growing revival of interest, for the first time in a century some new routes have been constructed. Is a short stretch of canal located in the town of Warwick, Opened in the 1790’s, originally it wasn’t an arm at all, but the start of the Warwick / Birmingham Canal. It took on the appearance of an (arm) branch.Warwick – Napton Canal, which junctions at the Birmingham Road / Budbrooke Industrial Estate, it is the last surviving branch (arm) of the much longer, nationally known Grand Union Canal. The arm was first opened in 1799 as a terminus for the Warwick and Birmingham Canal. Grand Union The 1930’s saw the site used extensively as a work yard and storage area during the construction of the nearby Hatton Locks. The transport act 1947 saw the canal network as a whole nationalized and British Waterways was formed after the Transport Act 1962 which split control of the canals and railways between two different authorities At this time, the arm, after leaving the main canal, passed under the Chiltern Main Line railway bridge and terminated at the back of what is now The Antelope Pub next to Sainsbury’s, making it around 750 meters long. During the 1970s however, with the decline of the gasworks, the downsizing of the town market and the opening of the A46 bypass, usage of the arm decreased and it eventually fell into disuse. It was during this period that part of the arm was taken out of use and filled in..This led to the canal terminating just before the Chiltern Main Line. The former canal bed is virtually untraceable, having been built over with houses and offices. All that remains is a bridge next to a car park. in 1982, the formation of the Saltisford Canal Trust which spent the next six years restoring the remainder of the route to its former glories. 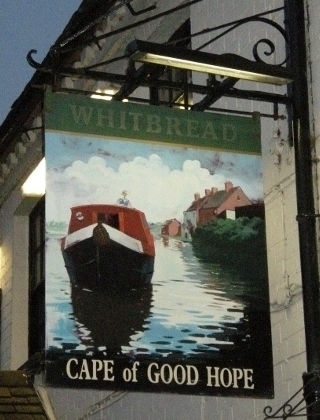 Further work was done in 2007, helped by a £2,000 grant from the Inland Waterways Association. The arm now houses several permanent boats, on which families live, as well as playing host to many travelling vessels, you can hire out the canal boat- Saltie-Two, contact 01926 490006 for further information. The site has a Visitor Centre selling gifts, books, handmade crafts, a chandlery & ice creams. Visiting boaters may use the on site services such as , launderette, water & electric hook up & coal supplies, sewage pump out and rubbish disposal. Narrow boat holidays in the heart of England. Canal boat holidays let you find the magic of the inland waterways. Where to eat – the Cape of Good Hope is a picturesque canalside pub with a great menu. The Wills and Clark families were owners and later tenants of the Cape of Good Hope for a number of years. The “Cape” forms part of property bought by Thomas Young in the period of 1830-47, and was passed to the Wills family through the marriage of Thomas Young’s daughter to John Wills. Subsequently the pub was occupied by Ellen, the widow of George Wills (d. 1882), and her descendants by her second husband, but was owned by the Wills family until its sale to Flower & Co in 1932, upon which the Clarks were tenants of the pub. Among the delights on offer in the sale of 1932 from William Wills to George Clark were a tin of Oyster Crackers and seven bottles of Ginger Wine, along with a variety of different styles of glasses and a Windsor Chair. An indication as to the relative prices of the day can be seen with the cost of the lease in 1948; £45pa. The Cape is still going strong, popular at lunchtimes with the workers at the local industrial park, and residents in the new developments of flats close by. It retains a traditional flavour with a rope maker based on-site and although no longer industrial, canal boats still pass by at regular intervals. Near Hatton is a flight of 21 locks where the Grand Union Canal ascends 146 feet over a couple of miles. The original locks on the Warwick and Birmingham canal were built in 1790 by the navigators or ‘navvies’ as they came to be known. The canal was renamed the Grand Union in 1929, and shortly afterwards new wider locks were built of concrete by a workforce of a thousand men. The new locks were opened by the Duke of Kent in 1934; they can take two narrow boats side by side. Some of the original narrow locks can still be seen alongside the new ones. Beside the Hatton flight of locks can be found a flat-bottomed maintenance boat for operating in shallow water. At each lock are four white winding devices for raising the paddles that control water entering and leaving the locks. You can also see the ridges on the ground that enable shoes to grip as the owner pushes hard on the huge balance beam to open the lock gates. In places the canal widens out into reservoirs to allow boats to pass and to save water for use in the locks. Nestled alongside the Hatton Locks, the Award Winning Hatton Arms offers a contemporary and casual drinking and dining experience, serving a superb range of classic cask ales and fresh British food. Refurbished back in 2013, guests can enjoy a relaxing meal or drink in a truly special environment that combines traditional and modern design. Guests can warm themselves in front of an open fire or dine alfresco and take in the breath-taking views of the ‘stairway to heaven’ A perfect place to relax and enjoy simple, yet beautiful food and drink. Cosy venue for breakfast, light meals, cakes and afternoon tea, plus waterside outdoor seating. By car – there is pay & display car parking just over the bridge from the Hatton Locks offices. By boat – there are moorings at the top of the flight along with some boating facilities.